St. Jacobs/Waterloo, ON, January 2, 2018 – Manufacturers Automation announced that Moxa launched MGate 5103 and MGate 5111 industrial protocol gateways enable fast and easy protocol conversions between Modbus devices and PROFINET/PROFIBUS-based SCADA systems and PLCs. These stand-alone protocol gateways also allow a distributed network architecture that maximizes flexibility and scalability. In addition, they also extend the lifetime of field devices, consequently reducing costs. With an all-in-one design, these gateways convert a variety of protocols, such as Modbus RTU/ASCII/TCP to PROFINET or PROFIBUS. 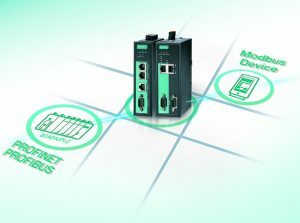 Furthermore, the MGate 5103 and 5111 also help integrate EtherNet/IP PLCs into PROFINET or PROFIBUS systems. “Configuration is often an arduous task, especially when adding PLCs for protocol conversion as it requires extensive coding. At Moxa, we spend a lot of time to ensure that our protocol gateways are easy to set up and use. The MGate 5103 and 5111 protocol gateways have a user-friendly interface that lets you quickly set up protocol conversion routines for most applications, doing away with often time-consuming tasks, such as implementing detailed parameter configurations one by one,” says KS Hsu, a product manager at Moxa. In addition, with Moxa’s configuration wizard, users can easily access protocol conversion modes and finish the configuration in five easy steps. Moxa’s MGate 5103 and 5111 protocol gateways provide a variety of powerful built-in troubleshooting tools, including protocol diagnostics and traffic monitoring, that offer engineers a shortcut to find the root cause of a network breakdown. Furthermore, the status monitoring and fault protection functions help reduce downtime. The status monitoring function alerts the SCADA system when a Modbus slave device is not responding. The fault protection prevents incorrect actions downstream when the upstream connection is lost.